85 Lukie Points will be rewarded to you when you buy this. 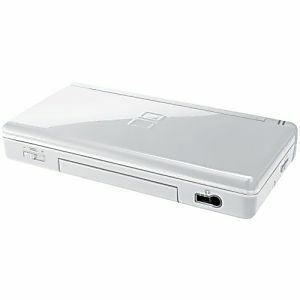 Pearl White DS Lite System in GREAT condition! This system has been tested and is guaranteed to work! The ds lite came in great condition, Thanks lukie games! I bought this item for my son's birthday and he loves it. The shipping is fast and easy. I was a little sceptical at first because it was a refurbished item, but it works perfect. Will order again from this site for Christmas. I really love the DS and I am completely enjoying it! Not sure why the screen is a little off the frame, overall works great. Ds lite came in GREAT condition, Looks good as new. Came in very fast, No problems at all, everything that was listed was included, No scratches or cracks! :) Highly recommend, I will definitely be a returning customer! First time ordering from lukiegames and just like everyone else that has ordered from them I will be a returning customer! The Ds came in GREAT condition just like it's described. Looks brand new. Shipped fast and packaged very well. Even got enough lukie points to get a game which arrived same day.